Flood Warning Persists in Some Parts of Mass. Sunday: Cloudy, scattered downpours. Highs in the 70s. Sunday Night: Patchy fog, passing shower. Lows in the 60s and 70s. Monday: Mostly cloudy, scattered showers and storms. Highs in the 70s to near 80. 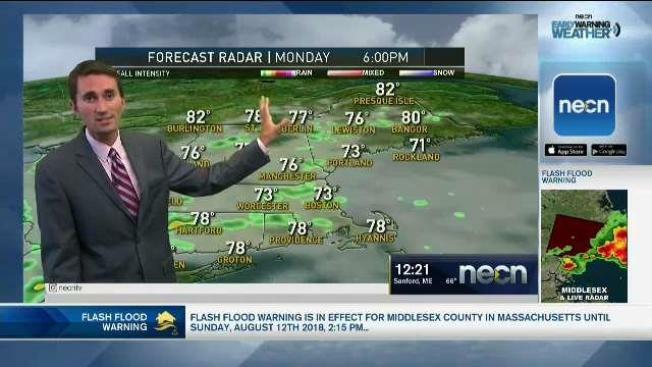 While Sunday is far from a washout for New England as a whole, parts of the North Shore felt the ferocity of the localized heavy rain. 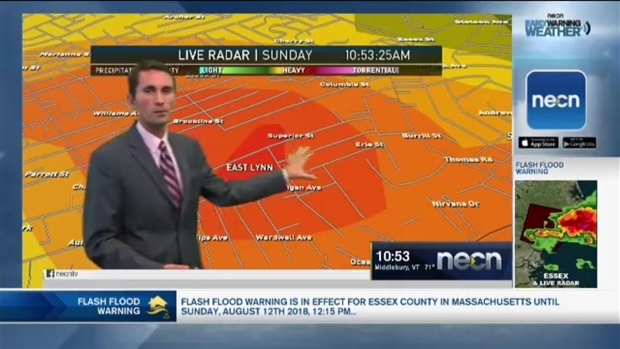 Peabody picked up more than 7” of rain in about 2 hours, with Lynn picking up more than 8”. Widespread flooding resulted, and the clean-up is now ongoing. For the rest of the day expect mostly cloudy skies with muggy conditions and temperatures in the 70s to near 80. A few more pop up downpours will roam around, so keep the umbrella on standby, but many places will enjoy dry hours. Monday and Tuesday will both be similar, with mostly cloudy skies and hit or miss downpours and storms. Highs will be in the 70s to near 80 with very humid conditions. Heavy Rain Leads to Flash Flood Warnings in Mass. Drivers are urged to use caution in some parts of Massachusetts due to heavy street flooding. A bit more sunshine returns Wednesday and Thursday, but we still can’t totally shake storms. It looks like the risk of wet weather is much lower, and mainly north and west of Boston, however. For the rest of the week expect temperatures closer to, but still a bit above, average.